Evening hymns hold a distinctive position in the history of Christian hymnody. Because of changing worship patterns over the centuries, they are not sung as often today. It is from “All Praise to Thee, My God, This Night” (1709) by Thomas Ken (The United Methodist Hymnal, No. 682) that we sing what many congregations call “The Doxology”: “Praise God from whom all blessings flow . . .” (stanza 4) Perhaps John Ellerton’s “The Day Thou Gavest, Lord, Is Ended” (1870) (The United Methodist Hymnal, No. 690) is the most majestic and global in its portrayal of the end of each day. The only other evening hymn in common use that rivals “The Day Is Past and Over” in longevity is the famous Phos Hilaron, an early church lamp-lighting hymn, translated as “O Gladsome Light” (The United Methodist Hymnal, No. 686) by Robert S. Bridges. Click here for a recording of the Phos Hilaron, which is still sung in Greek Orthodox liturgy. “The Day Is Past and Over” would have been sung in a similar manner in its original musical and liturgical context. 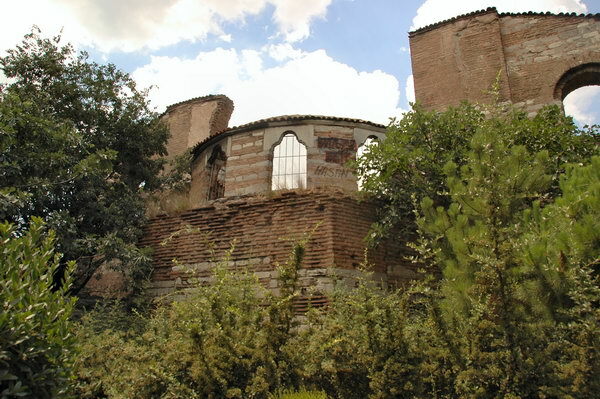 The Studios Monastery in Constantinople (also known as Studium, Stoudium, and other variations thereof) was a prolific hub of Byzantine hymnody between the 6th and 9th centuries. Reynolds, Music and Price describe how “from the beginning of the ninth century the Studium monastery at Constantinople became the center of Byzantine hymnic activity.” (Reynolds, Music and Price, 10). The walls of this monastery housed important hymn writers of the Eastern Christian tradition, such as St. Theodore of Studios (Stig and Hornby 2018) and Anatolius (d. 458). It is to Anatolius that John Mason Neale (1818-1866) attributed the text known in English as “The Day is Past and Over” (Watson, 2018). While Neale may have considered this to be St. Anatolius, it may also have been another writer by the same or a similar name, albeit writing during a later period. See the picture of the ruins of the Monastery of St. John the Forerunner in Constantinople (now Istanbul) completed in C. E. 463, a studium contemporary with the one associated with St. Anatolius. It is not an overstatement to consider Neale’s work foundational to the development of English-speaking hymnody, adding “new color to Protestant hymnody” (Benson 1962, 502-503). While it is true that Neale’s work has been challenged by Benson and others regarding the accuracy of his English-language versions and the doctrinal content of his translations of early hymnody, it must be emphasized that his approach to these translations was of a practical nature. Neale was more interested in translations that had the potential to become part and parcel of the singing repertory of the English church than in producing translations that were textually precise. 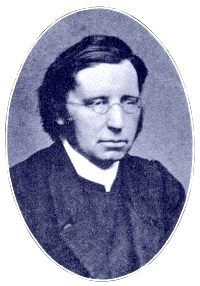 In other words, like other luminaries of Western hymnody such as Watts, Neale looked at his contributions with a practical eye to the worshiping life of the church, even as he brought to the table his significant skill and artistry as a wordsmith able to adapt the originals he was working with to the English-speaking ear and voice. As Benson says, “these strong and beautiful versions just filled the needs of contemporary and later Tractarians, and many of them passed the bounds not only of party but of the Church of England, and gave a new color to Protestant hymnody” (502-503). Thematically, “The Day is Past and Over” aligns with an ancient stream of Christian hymnody, that of morning and evening hymns. This is a stream that developed in parallel with the prayer habits of the church. Since the 4th century, “morning and evening do emerge as the pre-eminent hours of daily prayer, being seen as the Christian fulfillment of the Old Testament morning and evening sacrifices, and they come to be celebrated publicly in churches everywhere” (Bradshaw 2013, 141). In many cases (such as in Hymns Ancient and Modern ), morning and evening hymns are grouped together in a section. In The United Methodist Hymnal, each of the first three stanzas of the hymn describes the end of a daily cycle: “the day is past and over;” “the joys of day are over;” “the toils of day are over.” The fourth is a prayer for protection throughout the night, and a call for Jesus’ salvation. Neale’s translations, including “The Day is Past and Over,” made their way into the monumental British collections Hymns Ancient and Modern and the English Hymnal (1906), two hymnals that were instrumental in pairing texts and tunes for English-speaking congregations (Westermeyer 1998, 279). Although in most hymnals this hymn has appeared in combination with Arthur Henry Brown’s (1830-1926) tune ST. ANATOLIUS (Watson 2018; Dibble 2018), The UM Hymnal is one of the few that pairs this text with DU FRIEDENSFÜRST, HERR JESU CHRIST, a tune that first appeared in Bartholomäus Gesius’ Geistliche deutsche Lieder (1601). Gesius (c. 1562-1613) was part of a wave of publishers impelled by the development of the Kantional style of hymn tune composing and arranging. Its popularity may be attested to by arrangements by other famous composers of this era including Hans Leo Hassler, Johann Eccard, Melchior Vulpius, and Michael Praetorius (Reynolds, Music and Price, 31-32). The hymnals printed in this style featured “four parts, with the melody in the soprano voice and harmonized with simple chords, an approach which allowed congregations to sing the melody of a chorale even as the choir sang the other parts (31). The Kantional style gave an important push to the hymnic drive of the Reformation, as “hymn singing in the churches took on added strength and vitality” (32). The tune DU FRIEDENSFÜRST, HERR JESU CHRIST was later harmonized over a century later by J.S. Bach (1685-1750) in 1724. As is the case with other hymn tunes in the German chorale tradition, DU FRIEDENSFÜRST, HERR JESU CHRIST gained prominence from Bach’s practice of harmonizing and embellishing previous repertoire: “He made extensive use of the chorale in his cantatas and passions, harmonizing most of the melodies in four parts for singing by trained choirs. Some of his ingenious harmonizations are found in hymnals today, either intact or simplified for congregational use.” (Eskew and McElrath 1995, 110). Such is the case of this instance of “The Day is Past and Over” which spans centuries of time and diverse ethnic traditions, combining a 5th century Greek Eastern text, an early 17th century German Reformation tune, an early 18th century Reformation harmonization, and a 19th century British translation into English by one Christian hymnody’s preeminent translators of ancient lyrics. Benson, Louis F. The English Hymn: Its Development and use in Worship. Richmond, VA: John Knox Press, 1962. Bradshaw, Paul F. New SCM Dictionary of Liturgy and Worship. Hymns Ancient and Modern Ltd, 2013. Dibble, Jeremy. "Arthur Henry Brown." The Canterbury Dictionary of Hymnology. Canterbury Press, accessed December 27, 2018, http://www.hymnology.co.uk.proxy.libraries.smu.edu/a/arthur-henry-brown. Eskew, Harry, and Hugh T. McElrath. Sing with Understanding: An Introduction to Christian Hymnology. 2nd ed., rev. And exp. Nashville, Tenn: Church Street Press, 1995. Glover, Ray, The Hymnal 1982 Companion, Vol. 2. New York: Church Publishing Co., 1994. Reynolds, William Jensen, David W. Music, and Milburn Price. A Survey of Christian Hymnody. 5th ed., Carol Stream, Ill: Hope Pub. Co, 2010. Stig Simeon Frøyshov and Emma Hornby. "Theodore of Studios." The Canterbury Dictionary of Hymnology. Canterbury Press, accessed December 27, 2018, http://www.hymnology.co.uk.proxy.libraries.smu.edu/t/theodore-of-studios. Westermeyer, Paul. Te Deum: The Church and Music: A Textbook, a Reference, a History, an Essay. Minneapolis: Fortress Press, 1998. Marcell Silva Steuernagel, Ph.D., is Assistant Professor of Church Music and Director of the Master of Sacred Music Program, Perkins School of Theology, Southern Methodist University, Dallas, Texa.